52687 is rated 3.3 out of 5 by 14. Rated 5 out of 5 by Tim from Wonderful look I love the look and functionality of this shower head. It provides great coverage with its water spread. 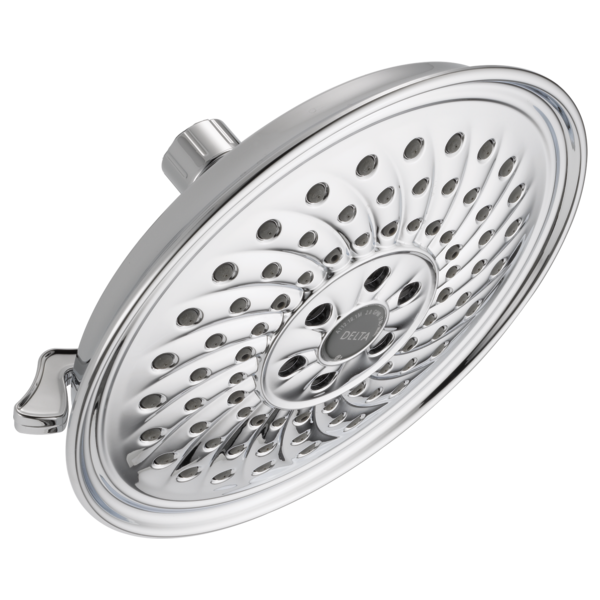 Rated 1 out of 5 by Jamie2019 from Worst shower head EVER I redid my entire bathroom and was so excited when I bought this for our new shower. TERRIBLE purchase. 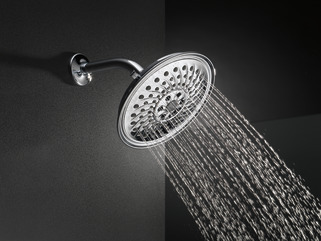 The water pressure is so bad I'm wishing for my old shower head from the 80's. My husband hates this new shower head and is very disappointed that a new 'rain can' shower could be this bad. It takes forever to rinse the shampoo out of our hair, so we have resorted to using our guest bathroom now. It's absolutely the worst shower head I've ever experienced. The water pressure in our home is great so I know that isn't the problem. DO NOT WASTE YOUR MONEY!!!!!!!! Rated 1 out of 5 by janet from Very disapointing! This is a terrible shower head. I was told that the H20 Kinetic technology would make the water come out stronger. That is not the case. Extremely disappointed. Would love to return for a different one. Rated 5 out of 5 by amie19 from Excellent Shower Head! I recently purchased and installed the Delta 52687 1.75 GPM Universal 8-1/4" wide multi function with H2Okinetic Technology to replace a shower head that was no longer functioning properly. The width of the shower head is well suited for larger showers and provides that luxurious rain shower experience. 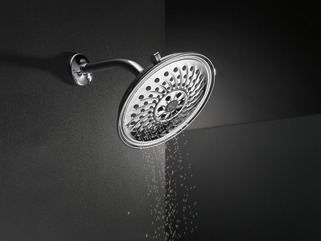 The shower head has several spray patterns to choose from to suit pretty much any preference. It was extremely easy to install. I highly recommend purchasing some plumbers tape as it is not included in the box, but is needed for the install. It installs in under 5 minutes. The shower head itself is very light and seemingly well constructed. Additionally, Delta backs up this product with a limited lifetime warranty. This is a great value if you are looking for a quick and affordable upgrade to your shower. Rated 2 out of 5 by notpleased18 from It's all plastic It worked great for a few weeks, then it broke at the base while trying to adjust the position of the head. I guess that's my fault for buying a plastic shower head. Then I had to use pliers to get it free from the water pipe because it was broken. That left plier marks on the cheap plastic material which customer service told me is now not covered under warranty because it has plier marks on it. Not sure what I could have done differently, other than buy one made of metal from a company that honors their warranty. Rated 5 out of 5 by Creekmom28 from Great Product! 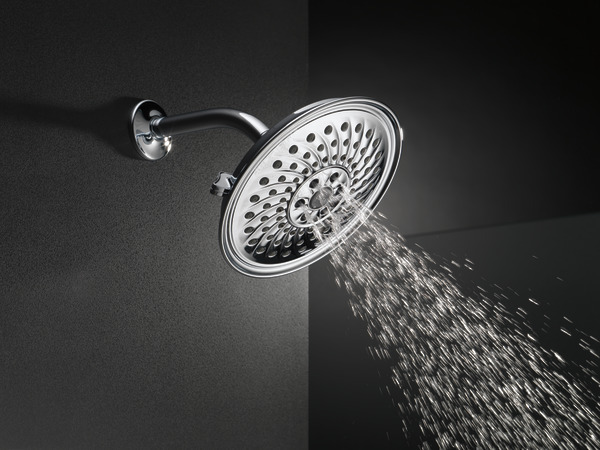 We love the large shower head! It is large and I love being able to turn the water off at the shower head so you can keep warm water waiting for when you need it. Rated 5 out of 5 by Hackensack 47 from Delta multi-function shower head When I purchased the shower head was not sure of how it would work. Since installing it, we are extremely satisfied with its performance. No negatives at all. Does this shower head swivel/tilt? Is this head plastic or metal? What is the max flow rate for this shower head? Do you make any shower heads that are not plastic? We are looking for Delta products that are not made of plastic. We prefer metal. Is there a water pressure reducing filter in this unit? I need more pressure. Can I use this as a ceiling rain head? I want to have this come straight down from the ceiling. If I just buy a 6 or 9 inch arm will this work? Thanks.